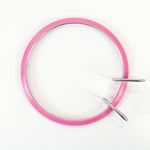 Ideal for machine embroidery because they slide easier under the sewing machine needle. Also good for all embroidery. Easy to get your hands around and keep the fabric taut without pulling.